This is the very famous Zara Necklace (Glass) that I was obsessed about - which is no longer available online and it makes me feel bad blogging about it because it has now become a very hard to find item. 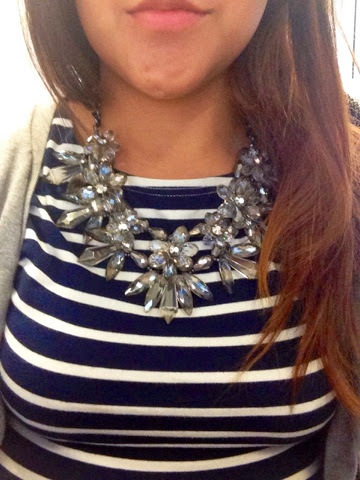 It was so popular that every single person I know watch on YouTube actually hunted (and found) this very necklace. I did the usual I-am-Australian-We-dont-have-Zara kind of pity party. So I thought the next normal thing to do is check online shopping but the shipping cost itself is more expensive than the necklace so I did the bravest thing... wait for it... I.Let.It.Go. A few weeks back, I had this wonderful day out with my lovely cousins and we did the whole mani-pedi session and chatted and drank copious amount of caffeine and possibly some sneaky glasses of bubbly all in a span of 4 hours - we also did the obligatory window shopping which led to some very very emotional purchases and one of which is this necklace. Spoiler Alert: Zara is opening soon!. I didn't just jump and grabbed it like a cave woman and started thumping my chest and dance my celebratory dance. I contemplated. Should I buy it? maybe not? Why now? The enabler cousins said Why Not? So I happily and shakingly took it off the rack and placed it over the counter and muttered the best phrase ever..I'll take this one please. I am not too sure if it's a dupe or is it the exact same thing. It feels like glass but it's not like the really heavy my neck is going to break heavy. It is pretty ok very pretty. It definitely adds that zazz (is it even a word?) to any boring outfit and I have too many of those. What can I say, I am just inlove with it. Sadly this is no longer available at Sussans..booo! But I did found it on eBay for you and there are others more in there but be careful, some are really over priced. Ok that's my ramble.How can someone write this much about a necklace. Spoiler Alert: It's not Tatum or Gosling.